Rays and crystals forming a 22º halo. 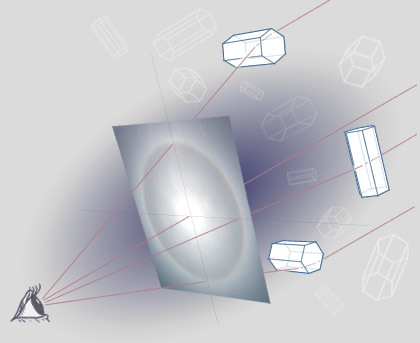 Crystals whose prism axes are roughly perpendicular to the direction of sunlight refract its rays through 22º or more. Each crystal sparkles in the sky when it is at this angular distance from the sun. The collective sparkles make the halo. Millions of other unlit crystals are not visible to you but they might be helping to form someone else's halo! Halos are the collective glints of millions of crystals which happen to have the right orientation and angular position to direct their refracted light into the your eye. When the sky contains "poorly aligned" crystals pointing in nearly all directions, which ones glint and where? How does so disorderly a host produce something so structured and ordered as a 22º halo? The key is still crystal orientation. Only those crystals with their prism axes roughly perpendicular to the sun's rays allow light to pass through two side faces. These all deviate light by 22º to 50º to form an illuminated disk with a 22º hole in its centre. The halo is brightest near the hole. When, as seen by the eye, they are also anywhere on a line 22º - 50º from the sun their light shines into the eye - they glint. But all the lines of those angles form an annulus around the sun. The glints 'light up' the disk to form the halo. And the other crystals that chance has neither placed nor aligned in positions favourable for you? They are not seen but they could be helping to create another person's halo. A halo only exists if something is there to see it. It is the effect of a collection of light rays travelling in particular directions and converging on a receiving lens be it an eye or camera. Each person sees their own halo. Someone standing only a short distance away sees another halo made from the collective glints of another set of crystals.